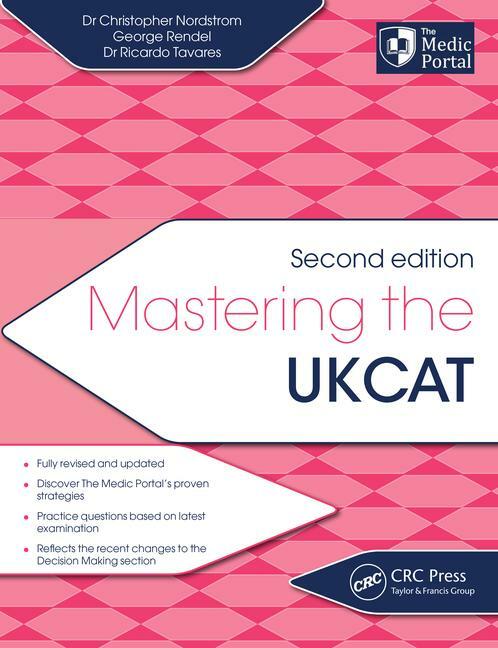 Drawing on The Medic Portal’s proven track record, this fully-updated second edition of Mastering the UKCAT takes you step by step through the proven techniques that have helped thousands of students achieve top UKCAT scores. Our expert authors deconstruct all question types before leading you through core strategies, common pitfalls, and top tips – as well as the tactics examiners use to trip you up. This book covers all parts of the UKCAT, including verbal reasoning, quantitative reasoning, abstract reasoning, decision analysis, and situational judgment. Dr Christopher Nordstrom graduated from University College London with a prize-winning degree in medicine and a first-class honours degree in neuroscience. He undertook medical training in London and now works as a senior doctor in emergency medicine. Christopher has been involved in medical education for over ten years, completing a PgCert in Clinical Education and gaining a Fellowship in the Higher Education Academy. He has received written praise for his teaching from hospitals and universities, including Imperial College London and University College London. His academic achievements include publications in world-renowned journals, published original research and regular presentations and national and international conferences. He has also peer-reviewed for the British Medical Journal and is one of the UK’s leading UKCAT and BMAT experts, regularly speaking at national events including the Royal Society of Medicine’s Career Day. George Rendel graduated from the University of Leeds with a first-class degree in English. He has used his academic understanding of the English language and his experience in journalism and publishing to become a leading expert in the verbal reasoning and essay writing components of the UKCAT and BMAT examinations. Ricardo Tavares, MA, MBBS, completed his medical sciences masters undergraduate degree at Oxford University and went on to finish his medical training at University College London Medical School. Dr. Tavares carried out his foundation training within the Imperial College Deanery before starting specialist registrar training in radiology. He has been published in leading international journals, spoken at numerous national conferences, and teaches on the clinical MD programme for the University of Buckingham Internal Medicine degree.